Mower Post, G. A. R., Woman’s Relief Corps, Co. K, I.N.G., and Public Schools Join With Citizens in Celebration of National Decoration Day. Clear skies and balmy winds ushered in Memorial Day after two weeks of cool and rainy weather and the change contributed much toward making the observance of the patriotic occasion one of the most interesting and largely attended Memorial services ever held in LeMars. The heavy “roads out” kept down the attendance from the country but the town people turned out in larger numbers than usual and two to three thousand people participated in the tribute to our nation’s dead heroes. The parade formed at the corner of Seventh and Main, the G.A.R. veterans marching to this point from their hall, escorted by Co. K.
The column formed in the following order: Colors, LeMars band, Co. K., fire department, Boy Scouts, Lieut. Governor Harding and other speakers in automobiles, members of the Grand Army and W.R.C. in carriage and automobiles, city officials and teachers, and the pupils of the public schools. There were twenty-eight veterans of Mower Post, G.A.R., in line and about an equal number from Sioux City. Co. K. had a good turnout and made a fine showing as did also the LeMars band, which has only appeared in public twice before. One of the inspiring features of the parade was the seven hundred and fifty school children with waving flags and smiling faces. At the cemetery the crowd gathered around an improvised platform placed just east of the monument which was covered with a large flag. Chas. Wernli presided and in calling the company to order paid tribute to the day and the sentiment that brought out the large assemblage to honor their soldier dead. The opening prayer was made by Rev. E. E. Gilbert, of the First Methodist Episcopal church, and Mayor F. J. Smith in a brief speech introduced the principal speaker of the hour. Following the lieutenant governor’s address, the chairman announced that Mrs. B. C. Woolley, a daughter of Dewitt Clarke and Miss Dorothy Martin, a granddaughter of I. T. Martin, would unveil the monument and expressed this appreciation of the fitness of the selection for that honor of the descendants of these pioneer residents of LeMars and old comrades in arms who now sleep in the shadows of the trees of the cemetery where the monument stands. As the large flag dropped from the face of the monument, the band played “America” and the large audience stood uncovered. Mr. Wernli, then on behalf of Plymouth county, formally presented the monument to the veterans as a tribute from the people of Plymouth county and it was accepted on behalf of Mower Post, G. A. R., by Commander A. A. Alline. The beautiful ritualistic service of the Grand Army was then read and the Relief Corp strewed flowers at the foot of the monument. A salute was fired by Co. K and Rev. S. M. Wilcox pronounced the benediction after which the buglars sounded taps. After all the graves were decorated in the City cemetery and the Catholic cemetery was visited and the graves of old soldiers buried there strewn with flowers. The monument is genuine Montello Granite, which received the gold medal at the World’s Fair at Chicago and is endorsed by the United States government for a large number of monuments located in the National cemeteries. The statue is made of U. S. Standard Bronze, and the total weight of the monument and statue is 22,600 pounds. 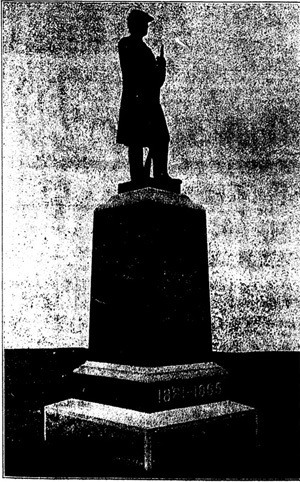 Dimensions of monument: Statue, six feet and four inches tall; die, three feet square and six feet and ten inches tall; second base, three feet and nine inches square and one foot and two inches high; bottom base, five feet and one inch square, one foot and six inches high, making a total of fifteen feet. There are 1,500 letters on the monument.